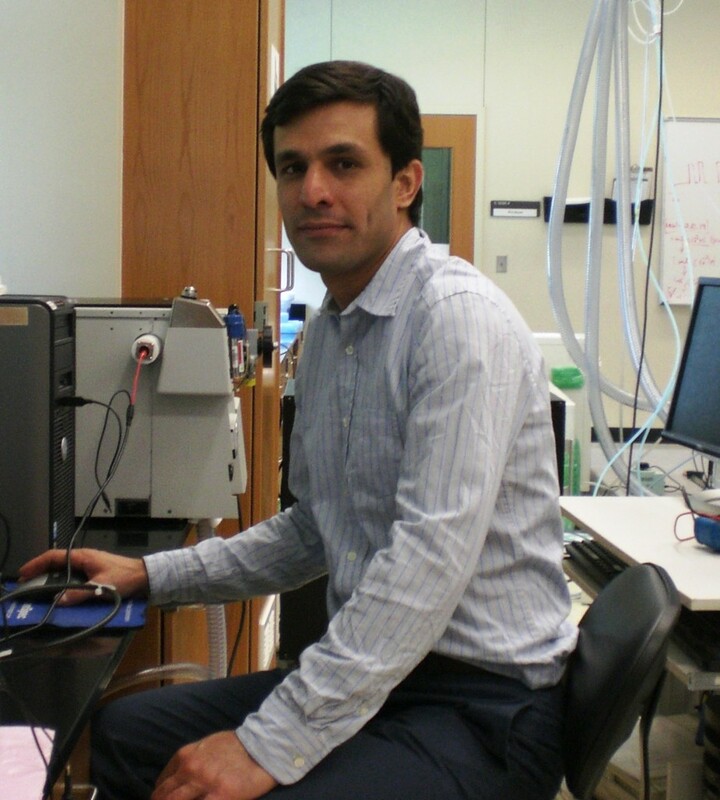 Dr. Behrooz Zekavat was a postdoctoral researcher for the Solouki Group at Baylor University. He worked alongside Dr. Touradj Solouki for seven years. He is originally from Iran. He completed his Bachelor’s degree at Razi University in Kermanshah, Iran in 2002, his Master’s degree at Sharif University of Technology in Tehran, Iran in 2004, and his PhD at the University of Maine in Orono. Behrooz currently works in research and development at Agilent Technologies in California where he helps develop new mass spectrometers. 1. Miladi, M., Olaitan, A. D., Zekavat, B., Solouki, T. “Competing Non-covalent Host Guest Interactions and H/D Exchange: ND3 Reactions with Benzyloxycarbonyl-Proline Glycine Dipeptide Variants.” Journal of the American Society for Mass Spectrometry, 26(11), 1938-1949, 2015. 2. Brantley, M., Zekavat, B., Harper, B., Mason, R., Solouki, T. “Automated Deconvolution of Overlapped Ion Mobility Profiles.” Journal of the American Society for Mass Spectrometry, 25(10) 1810-9, 2014. 3. Olaitan, A. D., Zekavat, B., Dhungana, B., Hockaday, W.C., Chambliss, C. K., Solouki, T. “Analysis of Volatile Organic Compound Mixtures Using Radio-Frequency Ionization/Mass Spectrometry.” Analytical Methods, 6(14) 4982–4987, 2014. 4. Zekavat, B., Miladi, M., Alfdeilat, A., Somogyi, A., Solouki, T. “Evidence for Sequence Scrambling and Divergent H/D Exchange Reactions of Doubly-Charged Isobaric b Type Fragment ions.” Journal of the American Society for Mass Spectrometry, 25, 226-236, 2014. 5. Zekavat, B., Szulejko, J. E., LaBrecque, D., Olaitan, A. D., Solouki, T. “Efficient Injection of Low Mass Ions into High Magnetic Field FTICR Mass Spectrometers.” Rapid Communications in Mass Spectrometry, 28, 230-238,2014. 6. Zekavat, B., Miladi, M., Becker, C., Munisamy, S. M., Solouki, T. “Combined Use of Post-Ion Mobility/Collision-Induced Dissociation and Chemometrics for b Fragment Ion Analysis.” Journal of the American Society for Mass Spectrometry, 24, 1355-1365, 2013. 7. Zekavat, B., Solouki, T. “Radio-Frequency Ionization of Organic Compounds for Mass Spectrometry Analysis.” Angewandte Chemie International Edition, 52(9) 2426-2429, 2013. 8. Zekavat, B., Solouki, T. “Chemometric Data Analysis for Deconvolution of Overlapped Ion Mobility Profiles.” Journal of the American Society for Mass Spectrometry, 23, 1873-1884, 2012. 9. Miladi, M., Zekavat, B., Munisamy, S. M., Solouki, T. “A Systematic Study on the Effect of Histidine Position and Fragment Ion Size on the Formation of bn Ions.” International Journal of Mass Spectrometry, 316-18, 164-173, 2012. 10. Fattahi, A., Zekavat, B., Solouki, T. “H/D Exchange Kinetics: Experimental Evidence for Formation of Different b Fragment Ion Conformers/Isomers During the Gas-Phase Peptide Sequencing.” Journal of the American Society for Mass Spectrometry, 21, 358-369, 2010. 11. Jalali-Heravi, M., Zekavat, B., Sereshti, H. “Use of Gas Chromatography-Mass Spectrometry Combined with Resolution Methods to Characterize the Essential Oil Components of Iranian Cumin and Caraway.” Journal of Chromatography A, 1143, 215-226, 2007. 12. Jalali-Heravi, M., Shahbazikhah, P., Zekavat, B., Ardejani, M. S. “Principal Component Analysis-Ranking as a Variable Selection Method for the Simulation of 13C Nuclear Magnetic Resonance Spectra of Xanthones Using Artificial Neural Networks.” QSAR & Combinatorial Science, 26, 764-772, 2007. 13. Jalali-Heravi, M., Zekavat, B., Sereshti, H. “Characterization of Essential Oil Components of Iranian Geranium Oil Using Gas Chromatography-Mass Spectrometry Combined with Chemometric Resolution Techniques.” Journal of Chromatography A, 1114, 154-163, 2006. 1. Zekavat, B.; Harper, B.; Brantley, M.; Pettit, M. E.; Solouki, T. “Use of Multivariate Curve Resolution and Ion Mobility-Mass Spectrometry for Isomer Differentiation.” Proceedings of the 62nd ASMS Conference on Mass Spectrometry and Allied Topics, 2014, Baltimore, MD. 2. Olaitan, A. D.; Zekavat, B.; Solouki, T. “Ionization Mechanism in Radio-Frequency Ionization (RFI).”Proceedings of the 62nd ASMS Conference on Mass Spectrometry and Allied Topics, 2014, Baltimore, MD. 3. Harper, B.; Zekavat, B.; Brantley, M.; Pettit, M.; Solouki, T. “Energy Resolved Ion Mobility Deconvolution of Isobaric Compounds.” Proceedings of the 62nd ASMS Conference on Mass Spectrometry and Allied Topics, 2014, Baltimore, MD. 4. Miladi, M.; Olaitan, A. D.; Zekavat, B.; Lochridge, J.; Solouki, T. “Effect of Metal Ion and Neutral Reagent Type on Gas-Phase Adduct Formation.” Proceedings of the 62nd ASMS Conference on Mass Spectrometry and Allied Topics, 2014, Baltimore, MD. 5. Zekavat, B.; Solouki, T. “The Use of Chemometrics for High Throughput Analysis of Ion Mobility and Mass Spectrometry Data.” 69th Southwest Regional Meeting of the American Chemical Society, 2013, Waco, TX. 6. Neumann, E.; Fontenot, S.; Zekavat, B.; Mowery, R.; Solouki, T. “Mass Spectrometry and Enhanced Chemiluminescent Western Blot Analysis of Recombinant Streptolysin O.” 69th Southwest Regional Meeting of the American Chemical Society, 2013, Waco, TX. 7. Zekavat, B.; Olaitan, A. D.; Solouki, T. “Analysis of Volatile Organic Compounds in Gasoline Samples Using Radio-Frequency Ionization/MassSpectrometry.” Proceedings of the 61 st ASMS Conference on Mass Spectrometry and Allied Topics, 2013, Minneapolis, MN. 8. Solouki, T.; Zekavat, B.; Olaitan, A. D. “A Novel Radiofrequency Ionization Method for the Analysis of Wide Classes of Volatile Organic Compounds.” Proceedings of the 61st ASMS Conference on Mass Spectrometry and Allied Topics, 2013, Minneapolis, MN. 9.Harper, B.; Miladi, M.; Zekavat, B.; Solouki, T. “Probing the Effect of Primary Structure Variance on the Gas-Phase Conformations of Insulin and Lispro.” Proceedings of the 61st ASMS Conference on Mass Spectrometry and Allied Topics, 2013, Minneapolis, MN. 10. Olaitan, A. D.; Zekavat, B.; LaBrecque, D.; Solouki, T. “Coupling Post-Column Cryogenic Trapping with Conventional GC/MS for the Analysis of Volatile Organic Compounds.” Proceedings of the 61st ASMS Conference on Mass Spectrometry and Allied Topics, 2013, Minneapolis, MN. 11. Solouki, T.; Zekavat, B.; Miladi, M.; Ramirez, A. J.; Olaitan, D. A. “Ultrahigh Resolution Analysis of Emerging Contaminants in Complex Sample Mixtures with FourierTransform Mass Spectrometers and Kendrick Plots.” Proceedings of the 243th American Chemical Society (ACS) National Meeting, 2012, San Diego, CA. 12. Zekavat, B.; Solouki, T. “’Placebo’ Response/Effect: Characterization at the Molecular-Level.” 18th Beach Tree Labs Annual Meeting, 2011, Albany, NY. 13. Zekavat, B.; Solouki, T. “The Use of Novel Ionization Techniques, Theoretical Ion Trajectory Calculations, and New Separation Approaches for Analyzing Complex Biological Samples in Placebo Studies.” 17th Beach Tree Labs Annual Meeting, 2010, Albany, NY. 14. Zekavat, B.; Solouki, T. “Injection of Externally-Generated Low Mass Ions into High Magnetic Field in Q/FT-ICR Instruments: SIMION Simulations and Experimental Observations.” Proceedings of the 58th ASMS Conference on Mass Spectrometry and Allied Topics, 2010, Salt Lake City, UT. 15. Solouki, T.; Zekavat, B.; Miladi, M. “On the Existence of Structurally Different Isobaric bn Fragment Ions.” Proceedings of the 58th ASMS Conference on Mass Spectrometry and Allied Topics, 2010, Salt Lake City, UT. 16. Miladi, M.; Zekavat, B.; Solouki, T. “Proton Affinity-Based Kendrick Plots for Classification of Oil Samples: Potential in Source Characterization.” Proceedings of the 58th ASMS Conference on Mass Spectrometry and Allied Topics, 2010, Salt Lake City,UT. 17. Zekavat, B.; Whipkey, R.; Solouki, T. “Placebo Study Activities at the University of Maine: A Summary.” 16th Beach Tree Labs Annual Meeting, 2009, Albany, NY. 18. Zekavat, B.; Szulejko, J. E.; LaBrecque, D.; Solouki, T. “Low Cost Higher Frequency RF Power Supplies For Quadrupole Ion Guides In FT-ICR Instruments with External Ion Sources.” Proceedings of the 57th ASMS Conference on Mass Spectrometry and Allied Topics, 2009, Philadelphia, PA.
19. Zekavat, B.; Al-Fdeilat, A. H.; Solouki, T. “Gas-Phase Basicity Measurements of Singly- and Doubly-Charged bn Fragment Ions Using ESI/FT-ICR MS.” Proceedings of the 57th ASMS Conference on Mass Spectrometry and Allied Topics, 2009, Philadelphia, PA.
20. Solouki, T.; Zekavat, B.; Whipkey, R.; Clark, J. “Proton Affinity-Based Kendrick Plots: A 3D Graphical Visualization of ESI/FT-ICR Mass Spectra of Crude Oils.” Proceedings of the 237th American Chemical Society (ACS) National Meeting, 2009, Washington, DC. 21. Solouki, T.; Zekavat, B.; Miladi, M.; Rasaiah, J. C.; Silwal, I. K. “Characterization of Petroleum Samples by GC/FT-ICR MS.” Proceedings of the 237th American Chemical Society (ACS) National Meeting, 2009, Washington, DC. 22. Al-Fdeilat, A. H.; Zekavat, B.; Collins, S.; Smith, R.; Solouki, T. “Characterization of a Microfabricated Electrospray Ionization (ESI) Device for Solution-Phase H/D Exchange in Non-Denaturing Media.” Proceedings of the 57th ASMS Conference on Mass Spectrometry and Allied Topics, 2009, Philadelphia, PA.
23. Zekavat, B.; Solouki, T. “Placebo Study Activities at the University of Maine.” 15th Beach Tree Labs Annual Meeting, 2008, Albany, NY. 24. Zekavat, B.; Al-Fdeilat, A. H.; Solouki, T. “Site-Specific Determination of Deuterium Incorporation in Bradykinin by Electron Capture Dissociation and Collision-Induced Dissociation.” Proceedings of the 236th American Chemical Society (ACS) National Meeting, 2008, Philadelphia, PA.
25. Szulejko, J. E.; Zekavat, B.; Solouki, T. “Improving the Performance of a GC/FT-ICR MS Using an External EI/CI Ion Source.” Proceedings of the 56th ASMS Conference on Mass Spectrometry and Allied Topics, 2008, Denver, CO.
26. Al-Fdeilat, A. H.; Zekavat, B.; Dhake, P.; Vaino, A.; Solouki, T. “Kinetic Studies and Determination of Proton Affinity Differences with ESI/FT-ICR MS to Investigate the “Reverse Anomeric Effect” in Gas Phase.” Proceedings of 56th ASMS Annual Conference on Mass Spectrometry and Allied Topics, 2008, Denver, CO.
27. Jalali-Heravi, M.; Zekavat, B.; Sereshti, H. “Characterization of Essential Oil Components of Geranium Oil Using Gas Chromatography/Mass Spectrometry and Chemometric Resolution Techniques.” ISAC, 2005, Birjand, Iran. 28. Jalali-Heravi, M.; Zekavat, B.; Shahbazikhah, P. “Quantitative Structure-Activity Relationship Study of Anti-Tubercular 4-Quinolylhydrazones and 4-Quinolylhydrazines Using Genetic Algorithm and Neural Networks.” 14th Iranian Chemistry and Chemical Engineering Conference, 2004, Tarbiyat Moallem University, Tehran, Iran.